‘She knew that it was shameful, this want in her for more than she was offered.’ (p 25-6) This novel is about a great love and the tragedy of those who accept less than they might have expected from love, or deny it to themselves. It’s also about the faith entailed in maintaining a love, when two people are parted. Being submerged can refer to the baby floating in amniotic fluid, to the cleansing ritual of baptism, to the act of submersion in love, or to the final act of drowning or death. Grief and guilt can be a form of immersion too. ‘He watches the waves and thinks of the tide, and wishes for something to save them all.’ (p 135) Jocelyn and Martin are drowning in love … and it takes a lifetime for them to be rescued. Jocelyn and Martin find what seems a pre-ordained love. In 1963, whilst doing a locum in the Blue Mts as a young and idealistic doctor, Martin meets Jocelyn, a somewhat introverted proofreader who lives in the house she inherited from her parents, and they feel an instant connection. They celebrate their first meal together with a fish – a biblical symbol of a meal celebrating familial connections. Jocelyn’s only sibling Ellen is married in England, and her fear of marriage after a failed teenage engagement, and the memory of her parents’ unhappy relationship, results in their moving in together at his house in Pittwater, an act which is socially inacceptable - she is regarded as ‘the doctor’s mistress’ (p 22) and ignored in the street. Nevertheless they share an idyllic summer before her pregnant sister Ellen returns from England with her daughter Cassandra. Jocelyn feels obliged to go home to look after them and Martin is forced to not only travel on weekends to be with her but to act as Ellen’s doctor as well. Her stories about abuse at the hands of her husband Thomas cause them to argue and Martin finds Ellen’s duplicity more and more difficult to take. He convinces Jocelyn to spend a weekend away, but then tragedy strikes and none of them are left unscarred. The idea of religion and of spiritual callings is central to this novel. Their love for each other has a religious quality so that when Martin prays and fasts he ‘prays her, stumbling, from his mind.’ (p 154) Similarly Jocelyn’s garden becomes a place of endurance and trial. Their belief in each other demands a life of devotion. Throughout the novel biblical symbols of healing, of gardens, of water and fish, birds, and of fire are used to cement the notion that theirs is a love higher than that of ‘mere mortals’. Martin’s medical calling has a vocational reverence and religiosity to it, in his profound respect for the intricacies of the construction of the human body. ‘Holding his hands out before him, fingers stretched, these instruments of the supernatural.’ (p 10) The idea of the medico as saviour is also suggested by the tragedy of Martin’s absence at Ellen’s delivery and by his diagnosis of the Chinese Mr Ho’s cancer which he knows will not be acted upon. His reverence for the human hand at the beginning of the novel when he recalls saving a bird as a child (pp 8-9) , is in stark contrast to his lack of faith when ‘he stared at his own hands, but they were only creased skin and veiny ridges, only flesh and cartilage and bone.’ (p 138) His retreat to a monastery is an attempt to replace one calling for another, and to submerge his love in that calling. Australia’s natural landscape is also contrasted symbolically with the manufactured gardens of Europe which Duncan designs, and the brutality of customs like the Spanish bullfight. But he refutes her criticisms, ‘You think there’s nothing brutal in Australia? Your whole country’s built on savagery.’ (p 240) The wild surreal forms of Gaudi’s Parc Guell remind her of the shapes and forms of home. (pp 247-250) The Flame lily is connected to Christ and to Australia as a country filled with red and bleeding plants. (p 257) ‘In a garden at night a choice is made. To escape, or to continue. Reason, or faith.’ (p 263) The mosaic she crafts is the symbol of this love. It depicts ‘the Gymea lily’s beautiful, decayed face. In the centre of that face, two swimming figures.’ (p 267) The bush fire makes of it and the garden a mockery and a charred wreck. (p 276) But bushfires also regenerate and make things new again. Lost children are another persistent theme. They are both tantalised by the story of the Victorian monks and the grave of the dead baby and by the stories of lost children in the encyclopedia Jocelyn is working on. Sandra has a picture book about a lost joey and Jocelyn worries that this will cement her aloneness now that her father is on the other side of the world. She also worries about the child Ellen will have. ‘Jocelyn begins to feel consumed by anxiety for these new lost children, born and unborn.’ (p 65) When the baby dies Martin retreats to the monastery they had read about, and visits the grave. Religion is also contrasted to medicine since the monks warn against belief in science as opposed to blind faith. St Bernard believed that ‘to seek relief from disease in medicine was in harmony neither with our religion nor with the purity of the order.’ (p 155) 'Martin used to think medicine was about knowledge, and faith about ignorance.’ (p 164) But now he’s simply searching for belief. ‘He is sick from wishing.’(p 165) ‘Each second is a point in time further from that day. He welcomes it.’(p 178) Martin does penance for what he believes is his failing. Jocelyn does as well. Water also has a baptismal or healing element. When Martin fetches up at the monastery his legs are ‘moving as though he had been months at sea.’ (p 150) His prayers there are ‘like swimming in green water.’ (p 153) ‘When Anthony feels his own reason to stay, it is like swimming.’ (p 166) Martin imagines Gethsemane as ‘a wide Australian lake, a garden of slivery water and broken trees.’ (p 190) Jocelyn’s pet project when she’s with Duncan is making mosaics from shells. When the birds fly over Jocelyn’s garden they score the air with ripples and the paddocks ‘are suddenly alive as water.’ (p 255) Water can act as a barrier as well. When Jocelyn writes to Sandra it’s as if it’s a ‘message dropped into the sea to drift towards that other, unreachable world.’ (p 244) Water separates Jocelyn and Martin for twenty years. All these references symbolically refer to the fact that water gives and takes away life. Marriage is another theme used to explore the concept of love and partnerships – Jocelyn’s fear of it, Ellen’s retreat from it; her own parents’ lack of love. ‘A marriage doesn’t have to be perfect. You make the best of things.’ (p 54) Her mother was always cleaning, ‘as if she could scour her marriage clean.’ (p 53) Their father’s ‘infidelities carried in the air around him like the cling of tobacco smoke.’ (p 54) Ellen finally confesses to Jocelyn, with horrifying candour that Thomas has always hit her ‘especially during pregnancies’ (p 55) and that this has caused her two miscarriages. Jocelyn’s liaison to Duncan fails because of a lack of love and communion between them. The question of violence is raised throughout the book, whether it be physical or mental, and the idea of whether a person may, by accepting it, become as much the guilty party as the innocent. Jocelyn’s anger that Ellen doesn’t complain about Sandra’s being smacked by a school friend is as much directed at her, as it is about Sandra. Jocelyn’s submission to Ellen’s will is as dangerous as hers to Thomas. Both entail sublimating personal need to that of another. There is also a suggestion that the religious vocation is just as destructive since it forces the clergy to quell their own instinctive needs. This sort of destructive love acts in stark contrast to the unselfish, generous love which Martin and Jocelyn had, and lost for years. 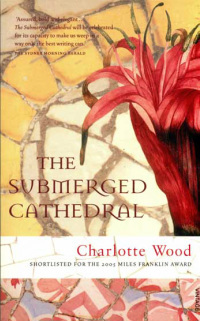 The submerged cathedral is a symbol for the crisis of faith Martin faces after the baby’s death and the effect it has on the love he and Jocelyn share. It refers to the Debussy La Cathedrale Engloutie, which reminds Jocelyn of a drowned city. (p 244) Their love is submerged under decades of grief, during which they each invest their spiritual needs in a vocation. But their real vocation is the love they have for each other. ‘Set me as a seal on your heart, for love is stronger than death. 1. Writers often use symbolic ideas (such as water in this novel), to make a point about character and theme. Fire is a symbol for their love too. Martin lights her cigarette when they meet in the restaurant; the encyclopedia Jocelyn is proofreading describes the fire of the banksias (p 20) ; they are setting the fire when he asks her to marry him and symbolically when she refuses they are burning a picture of a wedding in a newspaper, ‘The wedding party shrinks and shrivels the bride’s veil aflame.’ (p 20) ‘all the risk explodes like fireworks in the shimmering blue air.’ (p 25) The bushfire is related to the flame lily and represents a trial by fire. Were there other symbolic references that you noticed. 2. The unveiling of a story, or its structure, is as important as its content. This novel might have been told as a chronological progress from Jocelyn’s childhood to adulthood. However in telling it as a series of flashbacks to events leading up to her meeting Martin, and the aftermath, we are drawn into a web of emotional intrigue which maintains suspense – it’s as if the reader is holding her breath for the next revelation. It also makes the reader part of the story. We ‘meet’ Jocelyn as we might any real person, and then have to try and unravel the things which have made her who she is. This device continues when the three parts are told. The (Prologue) Part 1, Martin and Jocelyn 1963; Part 2, Martin 1964; Part 3, Jocelyn 1975; Part 4, Martin & Anthony 1984. Each is a surprise which adds to the questions asked about a possible ending. Discuss. 3. Characters are denoted by symbols and metaphors too. eg Aboard ship Ellen wears fancy dress with a serpent coiled around her with ‘little malevolent eyes’ (p 62) and ‘Jocelyn always sees her sister in red.’ (p 62) ‘And all the time Ellen tinkles, tinkles across the table.’ (p 68) She is the bad sister; the evil queen; the dangerous and brittle woman. Choose another character and read carefully to locate the symbolic references used to establish their nature. 4. Throughout the early part of the book, excerpts of the encyclopedia which Ellen is working on are reprinted. What meaning do they have in relation to the rest of the text? 5. Biblical Imagery and quotation is very prevalent in this book. E.g. Martin’s time tilling the soil at the monastery; Jocelyn’s time in the wilderness. What other biblical references did you notice? 1. The author’s note explains that this novel is a tribute to her parents’ romance. A few actual threads of that story (such as the monastery) are included, but this novel celebrates the essential ‘thematic’ elements of that romance - the accidental nature of fate and the enduring nature of a great love. Discuss. 2. ‘If we were married I could forbid you.’ (p 42) Marriage is a constant theme – Jocelyn’s memory of not being able to remove her teenage engagement ring is symbolic of the constraints placed on women in 1963. And yet if he had been able to demand her commitment, perhaps she would not have felt she owed Ellen her care? Discuss. 3. Why does Jocelyn marry Duncan? In order to wipe away the outcomes of her decision to abandon Martin? Or is it easier to commit to someone when you are not entirely convinced of your capacity to hurt or love them? 4. ‘They are clung together on the edge of a cliff. They jump.’ (p 20) Does this describe the act of committing to another person accurately? Is it always a plunge into the unknown? 5. The attitude to defacto relationships in 1963 makes one aware of the greatchanges which have been worked in society’s attitudes since then. What other major social changes does this book illustrate? 6. ‘They say you can inherit it,’ she says. ‘Violence, I mean.’ (p 69) Child abuse was a topic in Pieces of a Girl as it is in this novel. ‘She wants more than anything … to hurt her.’ (p 85) Is the abuse of a child always a possibility even by the gentlest or the most charming of people? 7. ‘Jocelyn tries not to think about Ellen and provocation and violence.’ (p 98) Is Ellen the real abuser rather than Thomas? Is violence ever justified? 8. ‘So young it begins, the hatred of women.’ (p 236) The shocking incident in the Alhambra echoes Thomas’s alleged treatment of Ellen. The Thomas/ Ellen story is never really concluded. What did you make of their situation? 9. ‘The child will love the mother through the heart of her rage, but the aunt must stay calm or be cast adrift.’ (p 84) Are baby sitters and carers in a ‘lose-lose’ situation? Is this why it is often hard for people to protect children from their abusive parents? Are the bonds too strong to break? ‘The mind of a child, the endless acceptance of new unthinkable things.’ (pp 63-4) Are all children as malleable as Sandra or has she learned to accept the unthinkable? Even her letter to Jocelyn conceding that her mother had hidden her letters suggested compliant acceptance of the fact rather than bitterness. Discuss. 10. The water represents the idyllic time they shared when they first met and yet the garden becomes their sanctuary. Is water a predominately positive or negative symbol in this novel in your opinion? 11. Accidents of fate often cause unimagined changes in lives. What other possible scenarios might have occurred in this novel? What other turning points were there which might have resulted in a different outcome? 12. Martin’s outburst against Frank is followed by him thinking that ‘this silly boy may be his salvation.’ (p 173) What does this mean? 13. ‘This life had acquainted Martin with hatred.’ (p 175) ‘Is this failure of courage the only thing keeping a monastery together?’ (p 188) Is the religious life often a destructive experience or is Martin simply unsuited to it? 14. Is love a religious vocation? Does it require extraordinary faith to preserve it? Discuss.